Currency transactions are not subject to restrictions unless the NBU introduces protective measures. 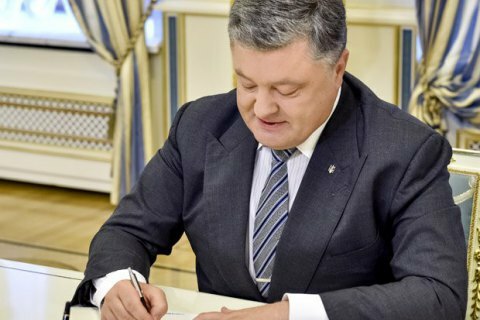 President Petro Poroshenko has signed the bill “On foreign currency” into law. “I would like to congratulate you. Right now in this room, this is a result of our joint efforts,” Poroshenko said at a meeting with business circles and signed the document. Under the law, foreign currency regulation in Ukraine is based on a flexible foreign currency exchange rate, the National Bank of Ukraine (NBU) is independent in forming and carrying out the currency and monetary policies, market tools of currency regulation have priority over administrative ones, the freedom of currency transactions must be ensured as well as the stability of the financial system and balance of payments. Non-residents enjoy the same rights as residents of Ukraine. The hryvnya is the only legitimate means of payment which must be accepted by all individuals and legal entities without restrictions in the entire territory of the state for settlements and transfers.